Keeping records of scores and grade averages is a part of required homeschooling record keeping for some. For those who need or want to keep records of scores and grade averages, I have added to donnayoung.org printable grade record forms. If you have a spreadsheet program such as Excel, please be sure to also look at my XLS graders. The XLS graders do the calculations for you. Grades and Attendance. I designed grades and attendance especially for those homeschoolers, like myself, who have to keep track of grades and attendance. The image below shows a close-up of the form. This is a suggestion of how to use the form. Lines 1-6 are for ONE subject. There are 10 rows of these groups of numbered lines. The subjects are written again on the second page of the form. REFERENCING THE GRADES: As shown in the image below, the first subject is Math. Notice that the letter "m" has been written next to each number and numbers have been written across the top. These marks or keys are for referencing grades. Example... the red grades are in: m1-5 and sp1-5. The purpose of referencing grades is that (if) you need to make a note of the source of the grade. 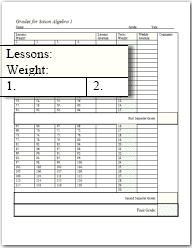 This form is meant for one single subject per school year per child. Form is broken into semesters and grades can be averaged every two weeks, each semester, and yearly. At the bottom of the form is a space for the grade scale. 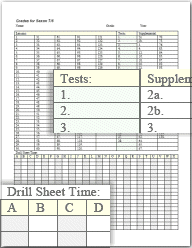 This form has space for 6 notes/projects/other as well as tests and daily work. 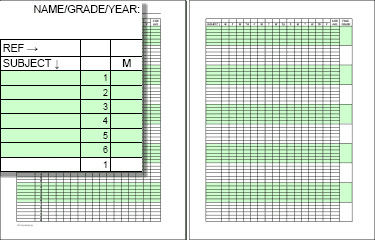 Add the grades in the days which the graded work was done. That means you will leave some of the cells empty.. which is fine. Roman Keyed - The cells are keyed by week and day. The days are noted with Roman numerals. Example.. the first Monday is I1, the second Monday is I2. To coordinate with a weekly planner, you will have to write in the key. The report card is described below in the PDF versions. 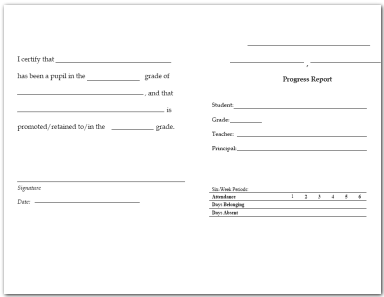 This is a basic fill-in-the-blank report card that uses six 6-week periods. Test print on scrap paper and if it they print correctly, print on card stock. Print side one then turn the card over and print side two. 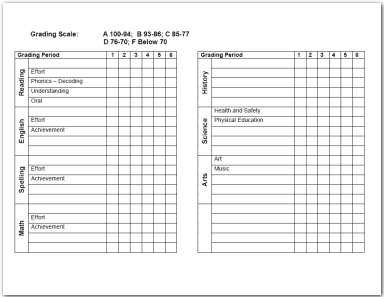 This is Side One, which is the front and back of the grade card. Choose Side Two based on the grading scale.